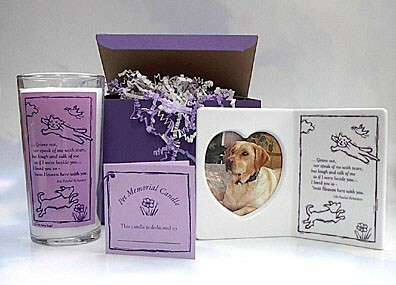 Our Furry Angel Pet Memorial Candle is made from an all-natural vegetable wax and a cotton wick. It is an all-natural, environmentally friendly candle with a dramatic crystal appearance that contains no animal or petroleum products and burns very cleanly. 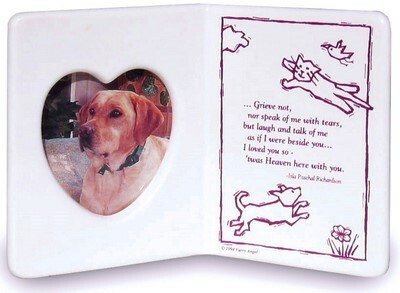 Our charming ceramic Furry Angel Pet Memorial Frame is a lovely way to keep a "Furry Angel's" photo near. The greeting card style frame measures 4 1/2" by 4". 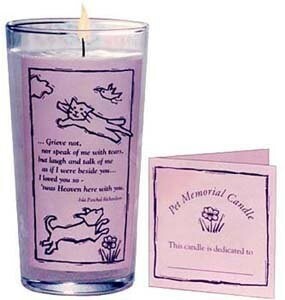 Pair it with the Furry Angel Memorial Candle for a very special gift. An example of combining several of our offerings. Remember your best friend in the soothing musical tones of our new Furry Angel Wind Chime. Our custom Winchimes are hand crafted & tuned from tempered aluminum tubing with a soft brushed finish. The windplates feature our exclusive engraved poetry and art from our featured candle and frame making this a truly unique gift for you or a loved one. Our wind chimes also create "environmental harmony." Cutting oils and soaps are 100% biodegradable and 95% of all manufacturing waste is recycled. 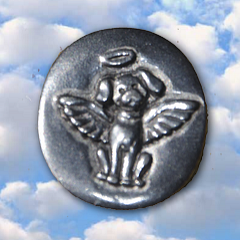 Our Pewter Cat and Dog Angel Coins strike the perfect sentimental note. 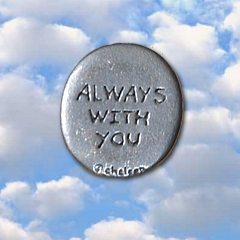 A keepsake pocket touchstone token is a simple and heartfelt way to keep your departed companion's memory with you.... always. 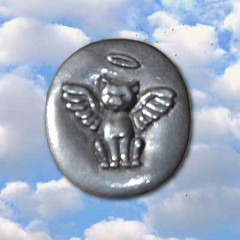 Pewter coin features an angelic cat or dog -- complete with wings and halo -- on the front, while the back is stamped with the message of "Always with you."